Wow, what an amazing selection of images you’ve sent us from your holidays around the world. As you can see from our final five photos, we’ve got temples in Burma, Italian peaks, Venezuelan falls and stunning Himalayan scenery – a positive cornucopia of travel experiences. As you can imagine, it was incredibly difficult choosing just five finalists and led to a great deal of heated debate in the office but, we hope you’ll agree, our final shortlist is pretty special. Now it’s over to you to vote for your favourite from those featured below. The winning photographer will receive a £150 voucher towards a Mountain Kingdoms holiday. In the early morning or evening light there is no more photogenic place than Bagan, as is evidenced by this captivating photo of the temples on the plains. In fact, Burma is a wonderful place for the keen photographer to visit with countless and varied photo opportunities. We can arrange a private tour to make the most of the cultural and scenic splendours. This exceptional view was taken from one of the most spectacular rifugios in the entire Dolomite range, rifugio Laguzuoi. This traditional mountain refuge is perched 700m above the valley floor and offers 360 degree panoramic views. 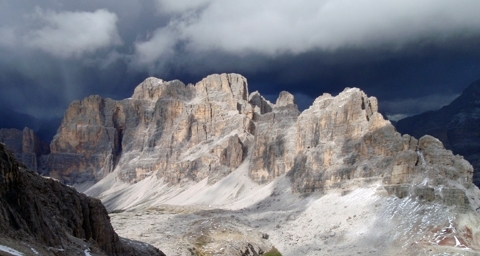 This image beautifully captures the dramatic mountain scenery with the stormy black skies emphasising the jagged ridges and the delicate pink hues of the dolomite rock. Rightly considered one of Nepal’s most beautiful mountains, Ama Dablam is a photographer’s dream. 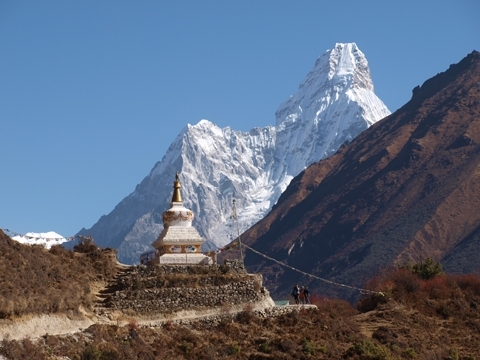 And, we think that this image of the mountain, together with a chorten and a group of trekkers, encapsulates the scenic appeal of the trail to Ama Dablam. The photo was taken on our luxury lodge trek which uses first rate trekking lodges en route. The dramatic and varied scenery of the Mustang region of Nepal has been perfectly captured in this photograph taken on our Mustang & the Kingdom of Lo trek. 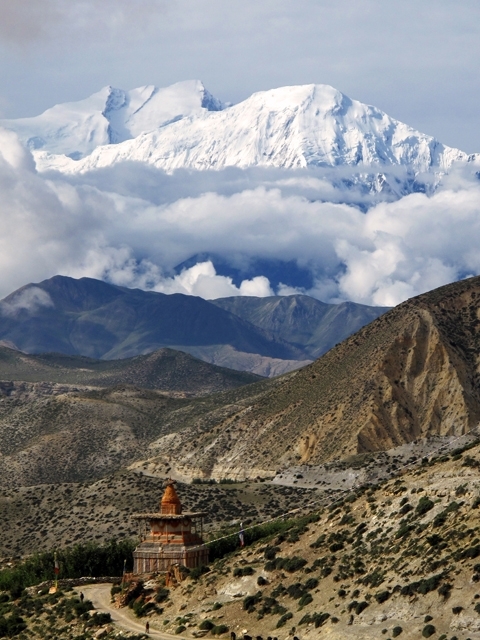 From desert landscapes to snowcapped peaks and cliff dwellings to cave monasteries, Mustang is full of cultural interest and spectacular scenery. And with access to the region limited via special entry permits, Mustang retains its unique identity and sense of mystique. 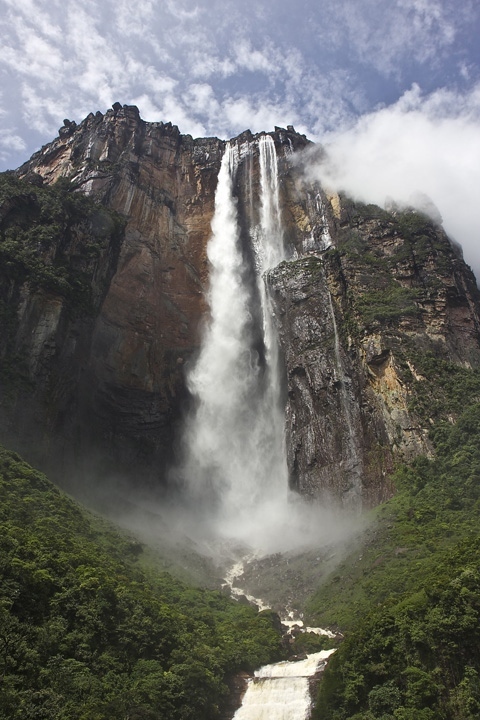 With a vertical drop of 807m/2,648ft, Angel Falls are the highest falls in the world and can certainly claim to be the most visually impressive. This dramatic image was taken from Ratoncito Island at the base of the falls which is reached via a boat trip up the Carao river followed by a trek to the island. This excursion can be made following our Lost World Trek to Mt Roraima in Venezuela.